AutoCAD is an application used for 2D computer-aided design (CAD) and drafting which was first released in the year 1982. This software has been developed and marketed by Autodesk and has use across sectors such as engineering, architecture, product designing. 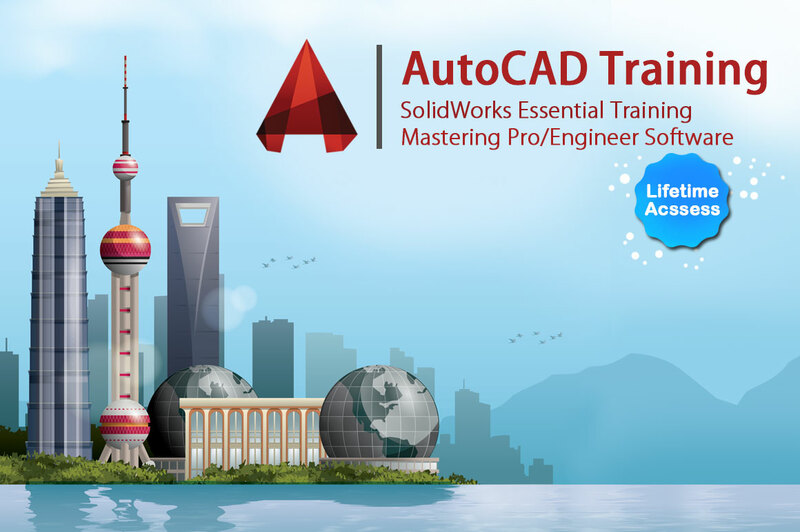 This beginners training on AutoCAD is to get used to the interface of this software which can help you prepare 2D models. The course is intended to provide a basic introduction to the Auto CAD software so that students are introduced to Computer Aided Designing atmosphere before they dive deep into it. The curriculum is designed in a way which encompasses the most common and widely used tools put together to bring better understanding to the student about the purpose of the software. SolidWorks is a superior Computer-aided Design software much utilized in transforming the Engineering, Architectural, Commercial and Product based blueprints and concepts into 2D and 3D solid models. The software brings the power of 3D to help every Engineer in creating a virtual clone of a product. It harnesses the design engineer’s imagination and caters valuable features to bring creativity to their designs. With SolidWorks designs and concepts of high complexity can be quickly converted into Solid 3D models. SolidWorks’ user-friendly and simplest Graphical User Interface that leveraged the potential of application to stay ahead of the market competitors as AutoCAD. Some of the important features of SolidWorks application are the Solid Modeling, e-drawing, DWG Editor, Simulation, PhotoView 360, Toolbox, ToIAnalyst and Circuit works. According to a survey conducted by the Massachusetts Institute of Technology in 2006, SolidWorks was selected as highly productive and potential CAD software. The survey revealed that the productivity difference between SolidWorks and other reputed CAD software tools is a staggering 95 percent, which left the counterparts far from matching the standards of the application. On numerous occasions, the same results are conveyed in various surveys that, SolidWorks provides better design visualization, offers better designing tools for more précised products, faster design iterations, design with minimum or no errors, creates a more aesthetic design and has high customer satisfaction ratio. One of the important attributes of the application is its ability to design numerous products and services and put them to test in a virtual world. The model proved as a cost effective method as the prototype testing phase can be carried out within the software once the product designing is finished. As a result, the software saves a great amount of money investing in the initial testing process and equally saves a great deal of time. SolidWorks is equally important in the field of engineering education by adding a great value to the career prospects. Pro/E Wildfire is generally referred as a parametric, feature-based solid modeling system. It is a set of programs that are put together to design, analyze and manufacture an infinite possibility of products in the virtual world. Though the application has stretched its limits into a host of Industries as Shipbuilding in the recent past, the core efficiency of the software is in providing solutions for the Mechanical designing. It helps to precisely create design and model creation and production of engineering drawings. Besides the drawings feature, the software is widely used to create a variety of piping layouts, mold designs, metal operations, wiring harness design and other more. These actions are carried out with the help of multiple modules Pro/E offers. Some of the important modules of the software are Behaviour Modeling Extension (BMX), Mechanical Design Kinetics, Mechanical Design Extension, Pro/Mechanica which is an add-on package. Feature-based software: It means the software enables the user to create various parts and assemble them. In this process, Pro/E supports the user intention with physically meaningful attributes such as holes, slots, extrusions, rounds, sweeps and more. These features make a great deal of difference as working in a two-dimensional drawing interfaces using splines, arcs, polygons or circles. Parametric Features: The term means that the part of the geometry or assembly are driven by the numeric values assigned to the attributes of its features. It means users can redefine or edit the supplied features of an existing geometry at any time. Solid Modeling: It means users can generate a high-end computer designed three-dimensional model that matches exactly with the object in the real world. The important point here is the virtual object will have mass and inertia and a specific value of density. The solid modeling goes to an extent, where if you make any changes in the geometry as drilling a hole in the model, the software intelligently identifies the areas where the change will effect and instantly creates the changes in the model. The software is launched several years ago and over time, PTC has brought in sophisticated changes that kept up with time and stood with the technological advancements of the Industry. The program looks like a windows replica making it one of the user-friendly interfaces. The workflow has also been enhanced with the introduction of mouse clicks and mouse gestures that help to speed up the working process. The Direct modeling mode of operation helps to create features very simply with several predefined tools. There are other sets of features that help the internet users to readily collaborate with the software.